Concorde 2 is excited to welcome down one of the worlds biggest events and labels in Techno & House, Kaluki Musik! Formed in a grubby basement in the famous Sankeys Manchester in 2006, Kaluki have gone on to become one of the most recognisable names in the scene, regularly selling out raves across the UK and holding a residency in Ibiza. With their name comes a stellar line up headlined by one of the hottest names in house music, SOLARDO! Fresh off their sell out UK tour, the lads from Kaluki's home of Manchester will be touching down to play a special set on the night! 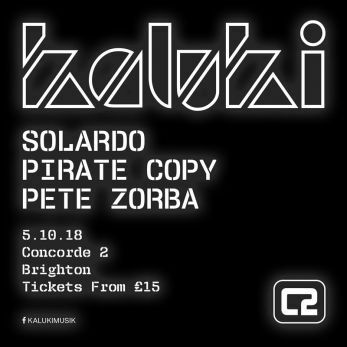 The night will be supported by trusted residents Pirate Copy & Pete Zorba!